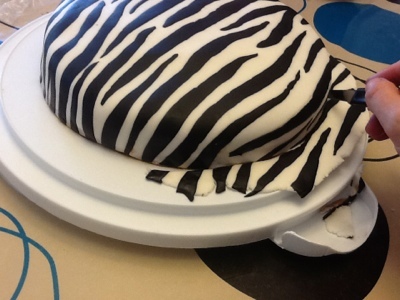 Zebra cake!! | ARTZCOOL'S BLOG! As I previously posted, Sam has been very specific in her birthday cake requests. 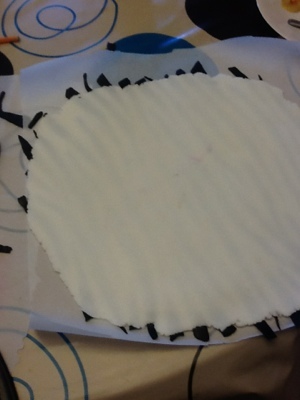 So, she wanted the bottom layer to be zebra skin to match her room. I treated myself to some new cake pans yesterday, so I baked the cakes last night. I mixed all the fondant colours yesterday too, so I am all set to go. 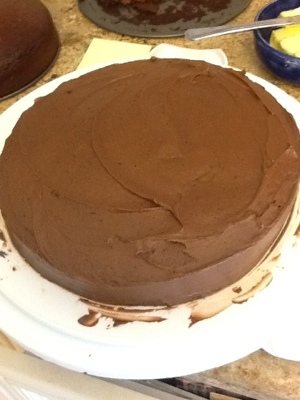 Except the fact that I forgot to buy vanilla icing, and just don’t have enough time to make it from scratch, so I used chocolate icing instead. 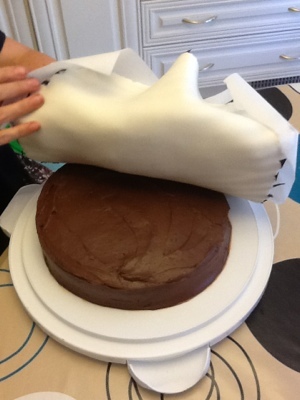 let’s hope it doesn’t show through the white fondant! 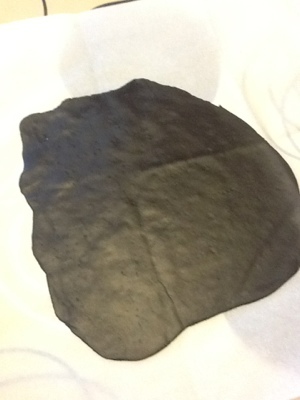 Then I rolled out a piece of black fondant as thin as I could roll it. 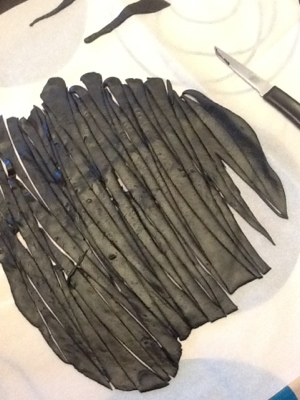 I used a paring knife to slice the black fondant into strips. I tried to cut the strips so at least one end was pointed. I continued until the entire circle of white fondant was covered. 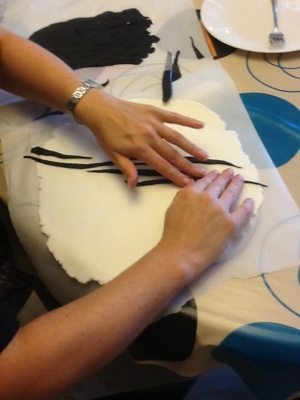 Then I put a sheet of waxed paper on top and rolled the two layers together. 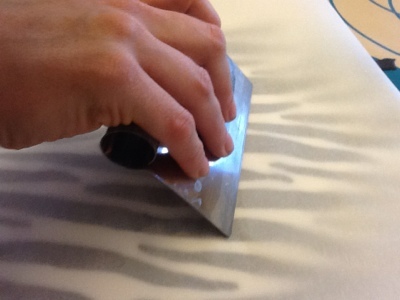 To put it on the cake, I flipped it over using the waxed paper on the top and bottom. Ta-da! 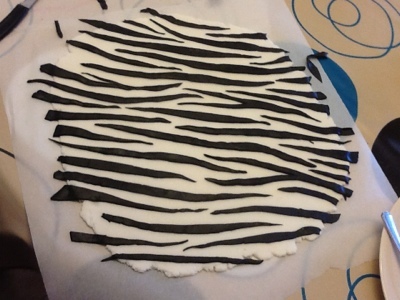 Bottom layer of cake zebrafied! Now all I have to do is make the animals, rainbow, trees, and background. How did u get the food color black ? Wilton actually has a black gel fool colouring. It’s pretty cool, it is a gel colour that you just mix in with a toothpick. As you can see, it does get it really black. This post has been so popular the past few days, I thought I would bring it back! That’s amazing! 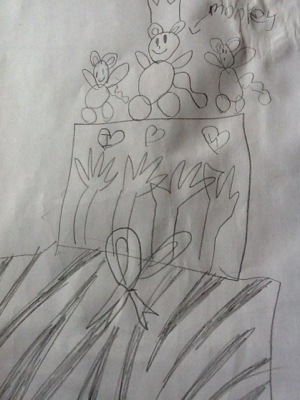 Do you have a pic of the finished cake complete with bears (i believe they are…) and trees? The non-baker in me is inspired! 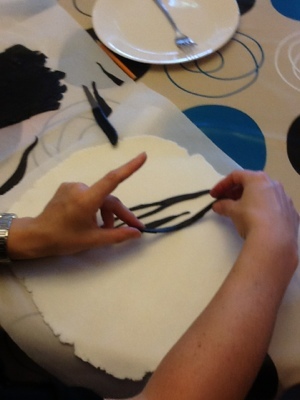 Wilton also makes a black fondant so you don’t have to get your hands messy!! Wonderful tutorial!!! I had trouble with the speed falling off after moving to the cake, did you secure them on the white with water or just rolled it in? 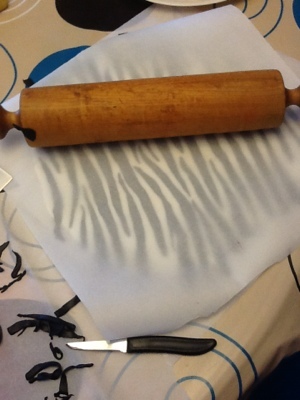 I mistakenly rolled the fondant onto the pin to lay on cake instead of lifting by waxed paper. Did you have trouble with that? I don’t think I added any water, from what I remember, the black colour would rub onto the white if it got wet. 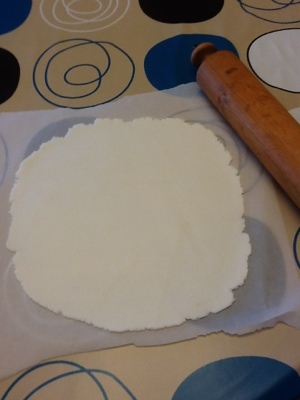 I use wax paper on the top and bottom of everything I roll out. 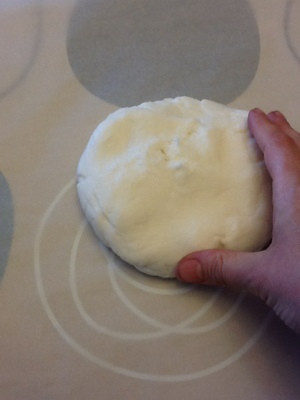 I did try to keep it covered so it stayed moist and didn’t dry out. And, I did roll it quite a bit to stick them together. Hope that helps! 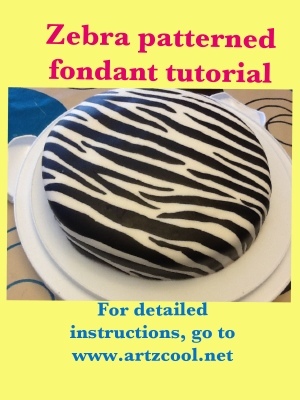 Thanks so much -The zebra cake has been one of my most popular posts! This is wonderful!! Thank u so much!! No problem! I am glad you enjoyed reading! Nice tutorial. Wish I didn’t have to close an ad tho every pic tho. After the third pic it gets a little ridiculous. Thanks for your feedback, I am not sure why there are pop ups, you are the second person to comment… I will look into it, I can see how that would be annoying! Glad you liked the tutorial though! This is simply fantastic. Am going to try this out most definitely. 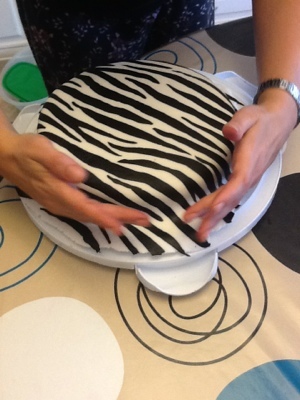 Thank you so much for sharing this idea, I used it to do a zebra cake on Friday and it looked amazing, and my niece was over the moon. Thank you for this tutorial! I’m making a cake like this and needed some pointers! Fantastic! I hope it worked out, I have made it a couple times!